I can't say that I am all that thrilled that it is Monday again. I really need a holiday and I am sure I am not the only person who feels like this. I really find June and July to be the months where I feel utterly exhausted and on top of it I can't believe how quickly this year is flying by. Last week Friday I was feeling quite sorry for myself and when I feel this way I always paint my nails with my favourite colour - purple. 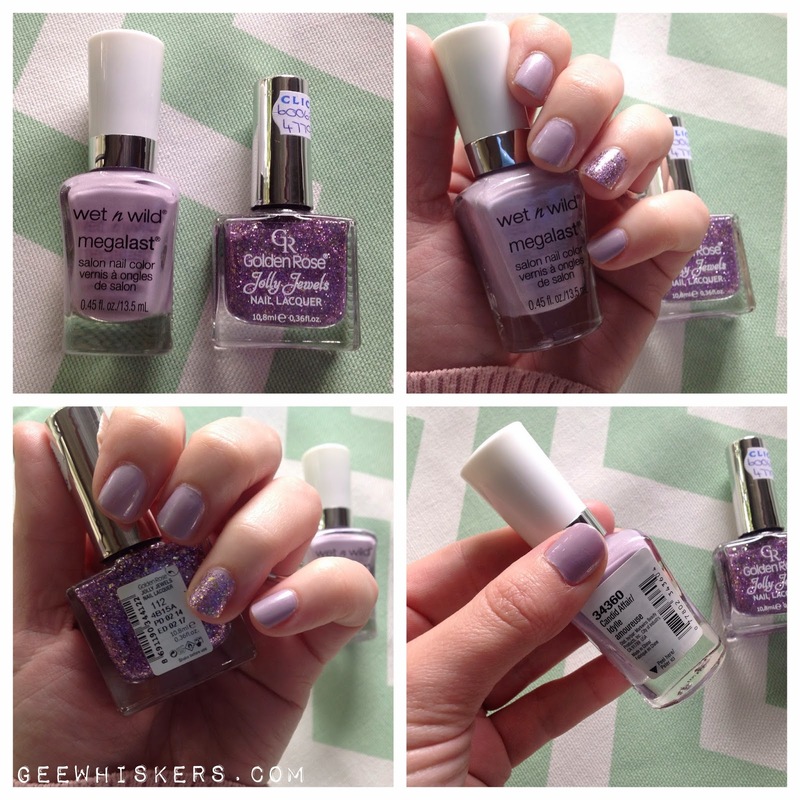 I used the opportunity to try out a Wet 'n Wild nail polish I was lucky to find in Clicks. I have really been struggling to find this in any of the Clicks stores. I also picked up a few Golden Rose nail polishes because glitter nail polishes always catch my eye. Wet n Wild Megalast in shade Candid Affair - the colour is a beautiful silvery lilac colour that has a bit of a shimmer to it in the light. I love the soft purple colour. The brush is very thick and wide which I always love in nail polishes however the brush in this bottle had a few stray bristles I had to cut into shape. That being said though, I found the application to be very easy and the colour applied evenly to my nails. I only got 2 days of chip free wear but this dries so quickly that redoing your nails isn't a complete pain. Retails for around R50 a bottle. There were only two colours available in the Clicks I found this which I bought for my sister. I definitely want to get a few more of these nail polishes. Golden Rose Jolly Jewels in shade 112 - When I spotted this range in Clicks I literally gasped from the excitement. There were so many wonderful shades available but I immediately put this shade into my basket . The nail polish is packed with glitters of varying sizes. I only applied one coat to my ring finger nail as I had a base colour using the Wet n Wild Candid Affair. With two coats you get complete glitter coverage. A word of warning though, this nail polish has a bit of a strong smell and takes AGES to dry. You literally need about 20 minutes to ensure a coat is dry and hardened. That being said, you get at least 1 full week's wear out of this before it starts to wear at the tips of your nails. With that kind of lasting power the drying time is worth it. Retails for around R55. They are fantastic - just wish the glitter didn't take so long to dry. I adore these types of colours on my nails - always makes me happy.